The Metropolitan Railway didn't bother with a station at West Harrow when the Uxbridge branch opened, because it was all fields. Later they realised fields=houses, dropped anchor and kickstarted development. 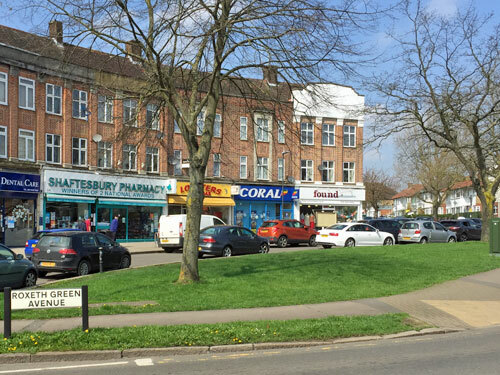 Today West Harrow bleeds into North Harrow and South Harrow, to the west of Harrow town centre, overlooked by Harrow-on-the-Hill. Expect what follows therefore to be somewhat harrowing, if not especially exciting. Opened in 1913, this station's never quite shaken off the ambience of suburban afterthought. 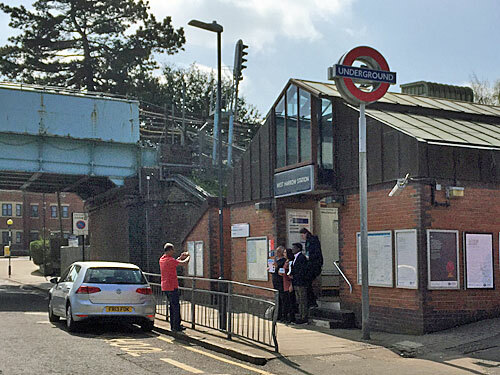 The current building was added in 1991 and looks a bit like a garden centre, admittedly a very small one, and serves only the London-bound platform. Westbound trains are reached via a separate (ungated) staircase on the other side of the bridge, watched over by CCTV to ensure every local resident touches in and out every time, which obviously they all do. The view from the platforms is of the largest collection of allotments in Harrow, hence the gentle curve retains an air of rural halt. Historical nugget: In 1955 the West Harrow Allotment and Garden Association spent £17 on an old railway carriage to act as an annex to their hut. Its eventual replacement cost £1700. I arrived at the station at the same time as a group of Conservative canvassers for next month's local council elections. They weren't here to press the flesh but to pose with a copy of their latest election leaflet, because nowhere else says "West Harrow" like the front of the station. They smiled at the photographer from a variety of angles, paused politely to let me pass, then went back to holding up their pieces of paper. Thanks to the appearance of these exciting images on social media, I can confirm that two of the group are currently councillors (in other wards), one heads up Harrow's Conservative opposition, one is studying politics at Portsmouth University and one is an award-winning cacti grower. The area's Labour MP has his HQ just up the road, opposite West Harrow Garage. The date on the gable of the first house opposite West Harrow station is 1914, as you might expect. But slightly further back is a small cluster of slightly older streets, predating easy access, surrounding a Grade II listed church. 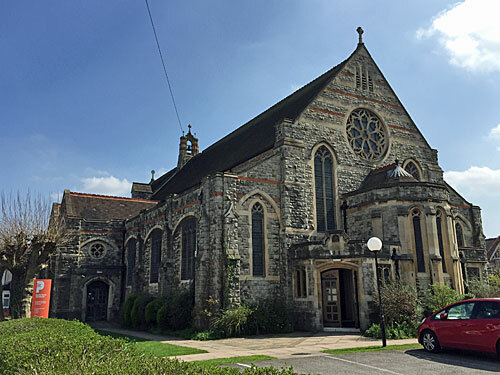 St Peter's was designed by a fellow called Fellowes Prynne, and knocked up from snecked rubble in a style described as Somewhat Italianate Late Decorated Gothic. These days it's bigger than it needs to be, which suits the multimedia style of the worshippers within, who seem very much at the modern end of all-inclusive Anglicanism. Come attend a relaxed informal service of contemporary worship, sign up for a mission-friendly Hub, and maybe relive the curate's Pokemon Go sermon. Eighteen minutes into his seminal Metroland documentary, John Betjeman reaches Harrow. He spends some time up with the boatered boys on the hill, but also takes time out to visit a row of unassuming houses which fall just inside the sphere of West Harrow station. I tracked down pretty much the right spot, compared and contrasted. I'd say the houses look much the same as they did almost 50 years ago, only are perhaps less well scrubbed. 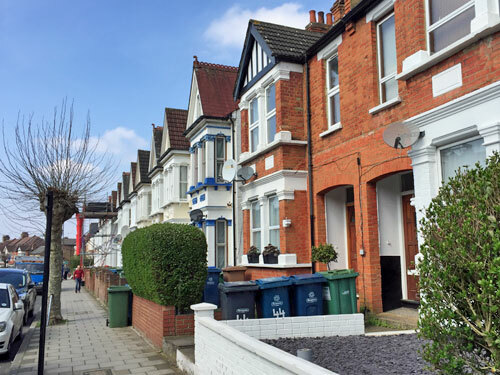 Harrow is now a four-bin borough, which doesn't help, and neither do the assortment of satellite dishes bolted onto the front since. Scaffolding and skips suggested a flurry of home improvement behind closed doors, as did the armchair one resident was pushing out into the street. Nobody was drying their clothes out of the front window when Sir John passed by, I'll wager, nor sitting on the doorstep smoking a fag. Well this is nice. The land for WHRC was bought from Roxeth Estates in 1923, which I know from the helpful information board the council erects at the gateway to all its recreational green spaces. This one has very much a sporting purpose, mostly football and cricket, but also bowls and tennis, plus a special "adventure area" for older children (which looks very much like a playground). The West Harrow Bowls Club Welcome Everyone, according to the sign at the entrance to their rinks, which was locked. They also offer free tuition, and have an Open Day coming up on Sunday 6th May, because new blood would be more than welcome. But mostly I found the Rec full of family strollers, elderly sitters and lads on bikes wearing massive Beats headphones. 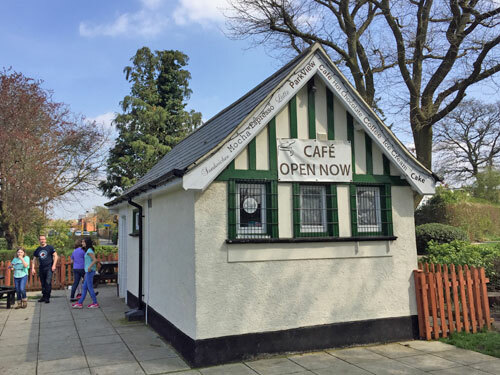 If only the Park View hut had been open, rather than locked with a banner reading "Cafe Open Now" hung on the front, everyone would have been even happier. One of the last infrastructure developments hereabouts, which stalled when World War Two broke out, was this circular intersection linking four swish avenues. Two quadrants formed shopping parades, one had the neighbourhood pub and the other was residential. The shops live on, including Lobsters Fish Bar and the Shaftesbury Pharmacy, the latter allegedly 'Winners of 2 National Awards', but their shop window is silent on the matter. As for the pub, not unexpectedly called The Shaftesbury, that's not unexpectedly transmogrified into a full-blown McDonalds drive-thru. It was packed on Saturday, along with a posse of moped-riding delivery boys out front, all contributing to the traffic jams this scenic roundabout now creates. Harrow School falls outside my geographical remit, but the playing fields on which its old boys play football creeps in. The Old Harrovians are technically the world's second oldest existing football club, two years younger than Sheffield, knocked together under the new association rules in 1859. Alas they never made the FA Cup Final in its earliest days, but one of their players inspired the competition, basing it on Harrow's inter-house knockout tradition. Also alas, Harrow abandoned soccer for rugby in the 1920s causing the Old Harrovians to vanish for thirty years, which is why they can't be the world's second oldest surviving football club. But they did thrash the Old Cholmeleians three nil last weekend, and are closing in on the Old Brentwoods in the Arthurian League Division 1, so are enjoying a decent season. Imagine being a pupil at the comprehensive school which looks out across the playing fields towards Harrow. That school is Whitmore High, an oversubscribed co-ed where actor Dev Patel once studied, before it was completely rebuilt in 2008 during that brief era when the government pumped millions into schools. The new building resembles a crab's claw from above, and a gently swooshing fortress from the front, cleverly denying public access to anything but the car park. Only the headteacher's parking space, immediately outside the door to reception, is labelled. At the end of the 19th century Pinner Road was the sole meandering lane through acres and acres of fields. 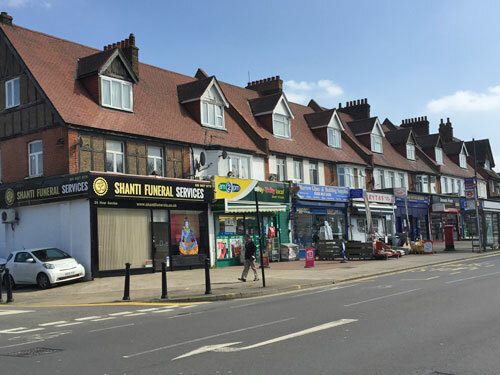 Unsurprisingly it got built up first, and now has the longest parade of shops in West Harrow's catchment area, plus a Tesco seeking to put several of them out of business. Largest of the competition is the Nita Cash and Carry, with its sacks of rice and stacks of loo roll and milk for a quid. Elsewhere I spotted a vegetarian caterers, a Yellow Fever jab clinic, a lawnmower shop called The Cutting Edge, a web designers called Aspiring Panda, an antique shop, Harrow's oldest tattooist, an Exclusive Indian "Restro-Bar", and a butchers guaranteeing 100% unstunned meat. Opened in 1887, this long strip of grassy burial ground off the Pinner Road is now 'full', other than for interment in family graves. It's now the ideal site to watch wildlife, walk the dog or to bring your two year-old to play in his model car, if only he were interested rather than staring at the miniature steering wheel in incomprehension. 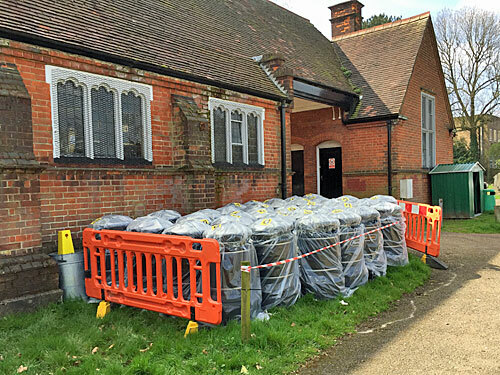 It's also, I'm excited to announce, the place where Harrow council stores its new litter bins. I found forty of them dropped off behind the old chapel, each wrapped in pristine plastic with a '50kg' sticker stuck to the top. Appearing soon on a street corner perhaps near you. And finally, yet another recreation ground, even bigger and better-loved than the last one. 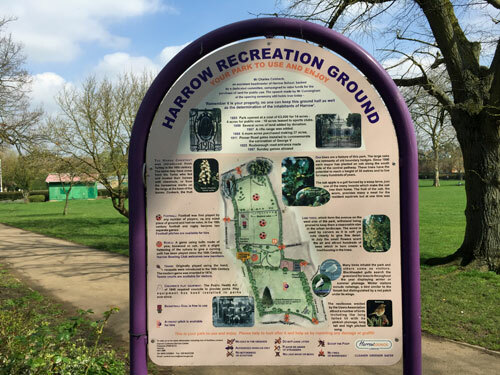 Harrow Rec opened in 1885, part park, but mostly sports pitches, sloping downhill with views across the town centre towards the church on the hill. Prior to 1967 it was locked on Sundays. 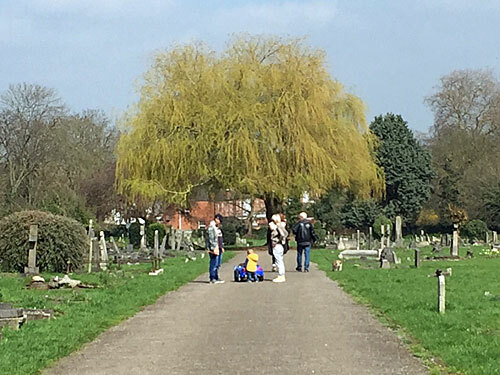 On the first decent weekend of spring it was busy with dogwalkers and joggers, chatterers and snoggers, and a heck of a lot of kids in football kits having encouragement bellowed at them by bellicose fathers. Birds sang. A red-bound copy of the Complete Short Stories of Somerset Maugham lay abandoned under a bench alongside an empty bottle of Русский Стандарт vodka. Budding Andy Murrays tapped meekly on the tennis courts. Couples posed for selfies stood in front of peak pink blossom. When the sun comes out, even a muddy park is still the place to be.